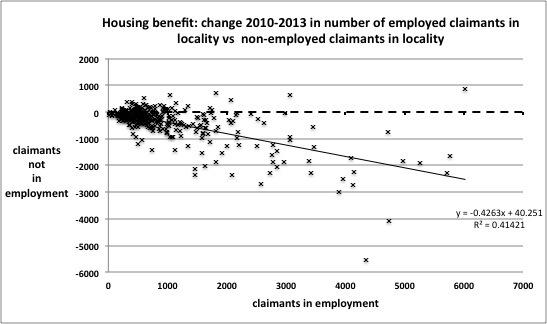 Further to the headlines garnered by the ‘astonishing’ rise in housing benefit claims by people in work…. I’ve managed to get hold of the dataset underpinning the Labour DWP team analysis. 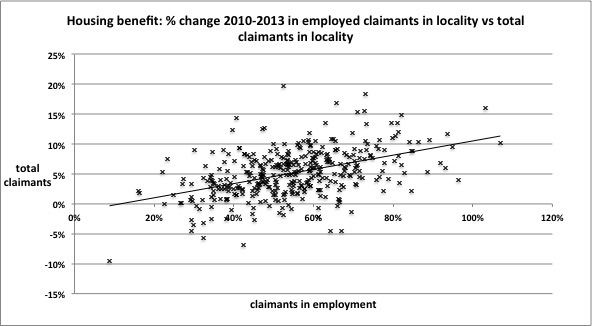 It lists by locality the number of claims by employed people and the number of total claims for May 2010 and November 2013, and the percentage increase in each between the two dates. The INDEPENDENT EXCLUSIVE highlighted the percentage increases in Croydon, Uttlesford, Fareham and Boston. I’ve marked these in red on a chart with a simple presentation of the data: plotting the percentage increase in employed claimants against increase in total claimants. No comment necessary on this really! Let’s take away the four outliers from the other near-400 localities. The plot changes to something clearer, and we can see an apparent trend with the increase in claims by people in work perhaps unsurprisingly associated with increases in total claims. Result nonetheless! Well as I pointed out on Monday you can’t infer that failure without considering whether the increase is caused by ‘workers newly claiming’ or ‘claimants newly working’. It’s quite simple to use the data to have at least a look at that, by subtracting employed claims from total claims to get the number of out-of-work claims and then compare change in out-of-work claims and in work claims. 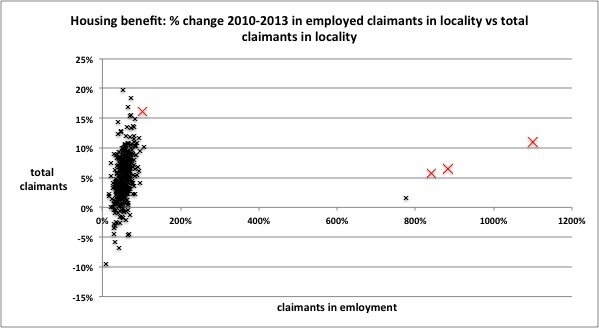 Taking away only two outlying localities, this shows quite a good correlation between rising in work claims and falling out-of-work claims. On the face of it, this suggests quite the opposite of the headlines, and that rather than workers increasingly struggling to pay their rents and turning to the state for help, that out-of-work claimants are increasingly getting jobs. That is I think probably the more meaningful result from this data. Hard to extract? Not really. As housing benefit is means-tested, it might be possible to check this result further if the value of the claims in question were known, as moving into work and increasing income would reduce the amount of an individual’s claim, and produce some change in average values of in work and out-work claims either overall or correlated with change in numbers or ratio by locality.